Camping trailers and RVs can be easy targets for thieves, as they can just drive away with not only with the valuables inside, but your trailer as well. RV crime is increasing and it’s becoming a serious concern for those who travel with their campers and trailers every year. 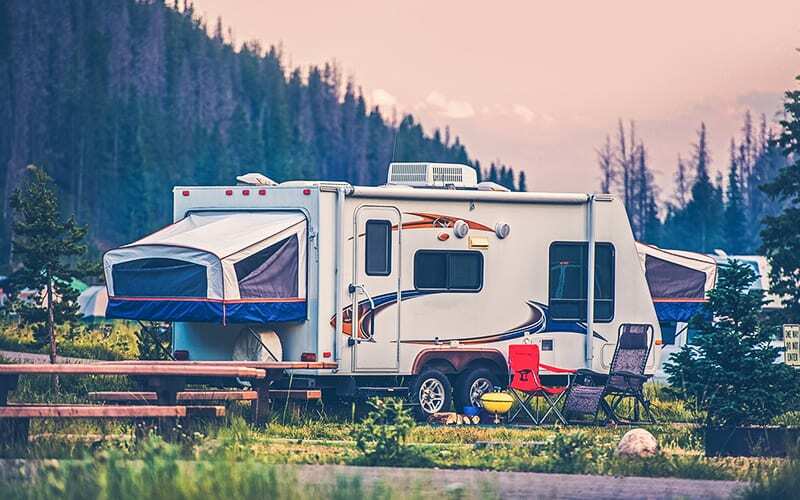 If you are a seasoned RV traveler or are new to the camping lifestyle, keep these tips in mind to keep your camper safe from would-be burglars. Consider how you park your trailer. When you arrive to the RV lot or campsite, or even if the camper is in your driveway, it’s important to consider how you will park your trailer. Most people will reverse their camper into a parking spot. Positioning the camper this way makes it easier to drive off when you’re ready to go home, but it also makes it easier for someone to hitch up your trailer (or jump in your car to take it) and be gone while you’re away hiking or enjoying the area. Instead, turn your camper around and put the hitch away from the standard access. This will deter potential thieves because they would have to physically turn the camper in order to steal it, which takes more time. You’ll need a jockey wheel or tongue wheel to park this way, which you can get at your local travel/outdoor store. Secure your trailer in every way. Locking your trailer goes beyond just locking the doors and windows, although these are important measures to take. In this case, consider a lock that goes around the kingpin. There are a variety of options available, with the two most popular locks being a pad lock and a cylinder lock. Both go over the kingpin. The cylinder lock, however, has a locking mechanism that keeps it in place. Some cylinder locks even come with a special key that can’t be duplicated. You may also want to consider getting a boot, which covers the wheel and prevents it from turning with an extension. The boot cover also prevents lugs from being stolen from the wheel. Thieves may try to change tires on the camper, even with a boot cover, so be sure to choose one that covers the lugs so tires can’t be changed. You don’t want your hiking gear or your cooking equipment to be taken simply because someone can see the items through the window. There’s safety in numbers. Camping around other people means there’s someone to look out for your space. Plus, thieves usually avoid populated areas. If you are traveling with any valuables, consider bringing along a small safe to keep your cash, credit cards, or jewelry safe. Find the right security system. It’s wise to invest in the right security system for your camper. You can choose from many options, such as alarms, a deadbolt, or motion detecting lights. In most cases, securing your RV is a small price to pay for the peace of mind you receive. Many RV owners enjoy the security that comes with motion detector lights. If you are camping in the middle of nowhere, or even when your RV is parked in your own driveway, it can get pretty dark at night. A motion detector light can help you feel safer as you enjoy your surroundings. A motion detector light will detect objects like cars, people, or animals. When motion is detected, the light turns on and stays on for a preset time, usually about 20 seconds. The light shuts off when the motion is no longer detected. Many security systems come with motion detectors as part of the package. You can look for options with the lights built in to your RV or you can install lights on your own. If you choose to install your own motion sensor lights, be sure to place lights 6 to 10 feet above the ground and point them toward the anywhere there is dark space. Consider placing lights behind the camper, at the door, and on any corners. Implement these tips to help keep your RV and what’s inside of it safe, whether it’s parked at home or out on an adventure.